New Students Can Try Any 3 Classes for $25. Please mention you saw this special on my site. What to try first if you're new to yoga? Yoga is a great way to relax, gain focus, body awareness and of course flexibility. At our studio we also offer fitness classes. On Tuesday mornings at 9:30am and on Sundays you can do both! Yoga & Fitness is a half hr. of fitness followed by a half hr. of yoga. Feeling like you need some personalized attention? Call and schedule an appointment so we can work on your particular goals. As a certified personal trainer, nothing makes me happier than helping you feel strong and fit! 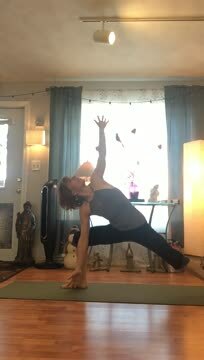 If you would like some private yoga sessions before starting out, I can do that too! Explore the site and call or email me with questions. I hope to see you soon. My new yogis have been asking for help with the Vinyasa so I made the above video. Hope you like it! Please share...thank you. Take 2 classes, get the third one, during that week, FREE! All classes are open to anyone because modifications can be made at every level. Yoga can provide you with strength, balance and flexibility. However, the most profound benefit can be the spiritual one. The sense of calm and focus we practice in class, the self -awareness will help you gain tranquility and peace. That is my most sincere wish.